US, 1935, 95 minutes, Black and white. Greta Garbo, Fredric March, Basil Rathbone, Freddie Bartholomew, Maureen O' Sullivan, May Robson, Reginald Owen, Reginald Denny. 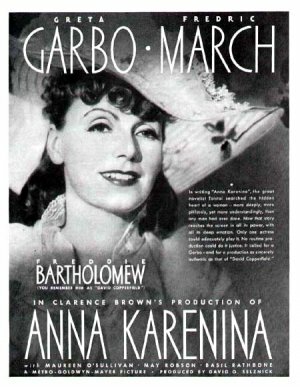 Garbo is regal, passionate, suffering as Anna. She is well-matched by Basil Rathbone as the cold and vindictive Karenina. Fredric March is the debonair Hollywood hero as Count Vronsky. There is a good supporting cast led by Freddie Bartholomew as Anna's son, Maureen O' Sullivan as Kitty. The film is lavish in its production and style - for instance the long tracking shots at the officers' banquet, the suggestions of Anna's fate in the focusing on trains, train wheels and train tracks. There are ball scenes highlighting the elegance of Russian high society. The screenplay was adapted by playwright Clemence Dane and the film was directed by Clarence Brown who directed Garbo in a number of features. 1. The status of Tolstoy's novel? Film adaptations? A vehicle for Garbo? In its time? Now? 2. MGM production values: black and white photography, the atmosphere of Russian society in the 19th century? The stylishness of the photography, decor and costumes? Set pieces - officers' meals, the balls, the trips to Venice? The domestic sequences and their pathos? The symbolism - especially for Anna's fate and death? Musical score? 3. The adaptation of the novel to the screen? The dramatisation of the characters? Their conflicts? Crises? Psychological accuracy? The picture of society? Morality? Anna's fate? 4. The portrait of Anna: Garbo's presence and style? Her marriage to her husband, her devotion, the coldness of the marriage, his concern about his career? Her love for her son? Her trip to Moscow to reconcile Stivi and Dolly? Her words about fidelity in marriage? The trip with the Countess Vronsky? The attentions of Count Vronsky? Kitty's being enamoured of him? The ball and Vronsky's attentions, Kitty's disappointment? Anna's falling in love with Vronsky, how much love, how much infatuation? her return home, the difficulties, the gossip? Vronsky's pursuit of her? The beginnings of the affair, their relationship, their being together, the freedom for Anna? Her wanting to be seen with him - the episode at the opera, people's gossip and reactions? Yashwin and the pressure on Vronsky to return to the army? The lyrical scenes together, romantic, the visit to Venice? Vronsky's boredom, wanting to go back into the army? The pressure on Anna? Her stealthy visit to her son, the confrontation with her husband? Her desperation, Kitty and her marriage, Dolly and Stivi reconciled, her position of uncertainty, public disgrace? The watching of the man testing the train wheels and the echoes from the beginning, her decision to kill herself? The romantic ending with the memoir? A dramatising of Tolstoy's tragic heroine? 5. Fredric March as Vronsky, style, debonair? His role in the army? His love of his status, fighting? The importance of the officers' banquet and their drinking one another under the table, his success? The meeting of his mother, the encounter with Anna, his pursuit of her and the ignoring of Kitty, following her in the train, his attentions, sweeping Anna off her feet, the lyrical episodes, the depth of his commitment to Anna. going to the opera and withstanding the gossip, the criticism of his mother? Venice? Restlessness? The arrangement to go back into the attic, his telling Anna? The passionate farewell, his hurting her? The impact of her death and his regrets? 6. The portrait of Russian society - Karenin and his coldness, bureaucracy, his driving ambition, the formalities of his marriage, his not wanting to be exposed, his telling his son that his mother was dead, the confrontation in the home? The contrast with the boy devoted to his mother, the presents, the tutor and. getting out of lessons, his desperately wanting to see his mother? The servants and the tutor, their helping Anna? The difficulties in the household? 7. Moscow society, Stivi and his roving eye, the clash with Dolly, Anna coming to the rescue, the reconciliation, Dolly's patience, Stivi's continuing roving eye - despite his lectures to Anna? 8. The army and its status, officers, gentlemen, their drinking, camaraderie? Yashwin and his sensitivity towards Vronsky and Anna? 9. Themes of society, propriety, keeping face, private morality? Anna Karenina (like, for instance, Ibsen's heroines) as standing for a woman being independent, not having double standards placed on her? Yet the pressures of men and 19th century standards overcoming her?